Sea-level rise is one of the most concerned aspects of climate change. High rates of the projected future sea-level rise have attracted attention of people worldwide. Particularly, countries which are located in low-lying areas as well as small islands are concerned that their land areas would be decreased by inundation and coastal erosion and, at worst, a large proportion of their population might be forced to migrate to other countries. 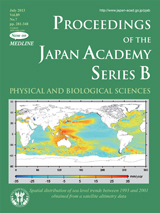 In the article, “Sea-level rise caused by climate change and its implications for society” on page 281-301, Professor Nobuo Mimura, a leading scientist in the related field in Japan gives a concise review of recent progress of studies on the whole subject ranging from scientific arguments on the sea-level rise to its possible impacts in various sectors of society and discussion how to respond to them. Sea-level change is caused by a combination of thermal expansion of sea water, melting and outflow of land-based ices including ice sheets in Greenland and Antarctica, storage of water on land, etc. In recent years reconstruction of the historical sea-level trend has improved considerably to reduce uncertainty due to the sparsity and non-uniformity of tide gauge observations. This progress was achieved by re-analyses of the past ocean observation data utilizing new information derived from satellite observation with a novel analysis method. The figure on the cover shows spatial distribution of sea level trends between 1993 and 2001 obtained from the TOPEX/Poseidon satellite altimetry data which is Fig. 1 of the paper by Lombard et al. (2009)*), and cited in the article by Professor Mimura. As seen, sea level rise is not uniform but shows remarkable difference among regions, mostly reflecting regional temperature change in the upper 750 m layer. We must bear in mind that regional sea level rise could be larger than global average, by which coastal areas are affected. Note that this figure is for the average trends for the period 1993 ~ 2001 and that the distribution will likely be different for other periods. *) Copyright and source of the figure: Alix Lombard (CNES), Gilles Garric (MGC/MERCATOR-Ocean) and Thierry Penduff (MEOM-LEGI), Ocean Dynamics 59, 433-449.